I love travelling with my Hubby. It is nice to have someone to chat with, someone to help with Miss. E and someone else to drive! Hubby does the majority of the driving when we travel together. I will drive now and then to give him a break but he really does the brunt of the driving. This leaves me with time to do other things. Here is what I pack in my road trip bag. Books- I love reading so I usually pack the novel that I am reading. I am nearing the end of my books so I packed 2 novels for this trip. Water Bottle (by Contigo)- I like to pack my own reusable water bottle. It is better for the environment and helps me to remember to stay hydrated. This one is great because it doesn't leak. Love Hearts- I am seriously addicted to these candies. I like to nibble on them on road trips! Yum! Change purse- This is always good to have on hand for parking meters or a coffee run. Cross-body bag- Honestly, my Coach bag is pretty much the only purse I ever carry. It is small so I don't ever overfill it, which is important due to my neck issues. Notebook and Pen- Ideas seem to pop in my head on the road so I like to have a place to jot them down. I found this notebook at the Dollar Tree! The pen was a gift from my Hubby. It allows you to use 4 different colours. It writes nicely, too. Hubby knows me well. I really love this pen! Lip Balm (from The Body Shop)- My lips get super dry in the vehicle, likely from Hubby blasting the AC on our trips. I love the feeling of this lip balm and the raspberry flavour smells so good! 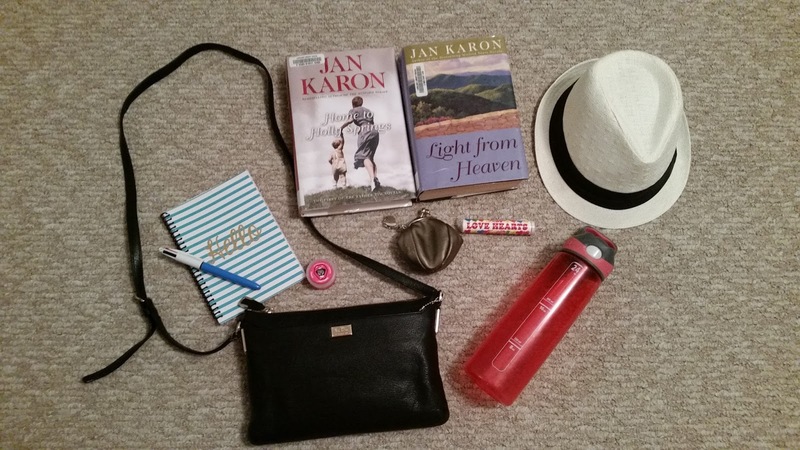 What do you pack in your road trip bag? They are so delicious smelling and they feel great! Wow, does all that stuff fit in that little bag?! If so, I'm seriously impressed! :) That's a cute little notebook! I'm always a sucker for fun stationery and pens! Ha ha! No! Sorry. I looked back and realized that I didn't include a picture of the tote that carries it all. #oops!